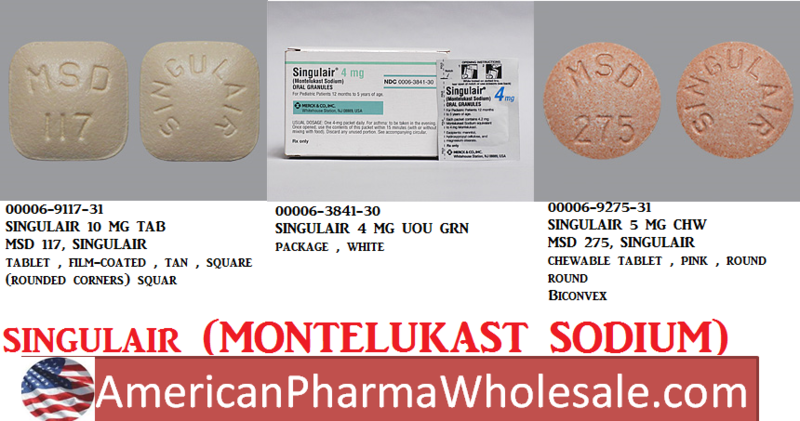 SINGULAIR® is indicated for the prophylaxis and chronic treatment of asthma in adults and pediatric patients 12 months of age and older. SINGULAIR is indicated for prevention of exercise-induced bronchoconstriction (EIB) in patients 6 years of age and older. SINGULAIR is indicated for the relief of symptoms of seasonal allergic rhinitis in patients 2 years of age and older and perennial allergic rhinitis in patients 6 months of age and older. An additional dose of SINGULAIR should not be taken within 24 hours of a previous dose. Patients already taking SINGULAIR daily for another indication (including chronic asthma) should not take an additional dose to prevent EIB. All patients should have available for rescue a short-acting ?-agonist. Safety and efficacy in patients younger than 6 years of age have not been established. Daily administration of SINGULAIR for the chronic treatment of asthma has not been established to prevent acute episodes of EIB. For allergic rhinitis, SINGULAIR should be taken once daily. Efficacy was demonstrated for seasonal allergic rhinitis when montelukast was administered in the morning or the evening without regard to time of food ingestion. The time of administration may be individualized to suit patient needs. Patients with both asthma and allergic rhinitis should take only one SINGULAIR dose daily in the evening. SINGULAIR 4-mg oral granules can be administered either directly in the mouth, dissolved in 1 teaspoonful (5 mL) of cold or room temperature baby formula or breast milk, or mixed with a spoonful of cold or room temperature soft foods; based on stability studies, only applesauce, carrots, rice, or ice cream should be used. The packet should not be opened until ready to use. After opening the packet, the full dose (with or without mixing with baby formula, breast milk, or food) must be administered within 15 minutes. If mixed with baby formula, breast milk, or food, SINGULAIR oral granules must not be stored for future use. Discard any unused portion. SINGULAIR oral granules are not intended to be dissolved in any liquid other than baby formula or breast milk for administration. However, liquids may be taken subsequent to administration. SINGULAIR oral granules can be administered without regard to the time of meals. This Item Can Only Be Ordered By A Drug Mfg, Wholesaler,Pharmacy,Physician, Dentist, Podiatrist, Optometrist,Veterinarian,Naturopath,Licensed Lab, Physical Therapist & Pharmacist(scope).